(Huntsville, AL) – For self-identified “foodies,” and those who simply enjoy a good meal, the best time of year has arrived. 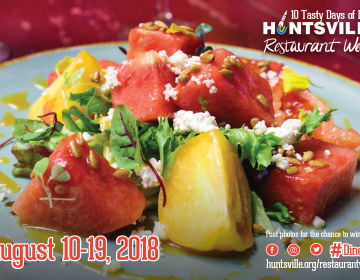 August 10th kicks off the 7th annual Huntsville Restaurant Week, a county-wide event that promotes locally owned and operated restaurants by encouraging patrons to explore the diverse dining scene of Madison County, and providing unique culinary events for both residents and visitors alike to enjoy. Today the Huntsville/Madison County Convention & Visitors Bureau (CVB), along with City of Huntsville representatives and members of the local hospitality industry, gathered at Purveyor Huntsville to announce this year’s participants and special events. Over 50 local eateries and breweries are participating with special offerings. Huntsville Restaurant Week is a part of the larger, statewide Alabama Restaurant Week which promotes the state of Alabama’s unique culinary offerings by encouraging residents and visitors to get out and try local cuisine. “As the coordinator of Huntsville Restaurant Week, it has been my pleasure to see this promotion grow. Each year it is surprising to see how many new places have joined the Madison County culinary scene, and in 2018 we have many first time participants, including several of our area attractions. Ultimately, the CVB’s goal for Restaurant Week is to showcase the Madison County dining scene to visitors and to remind locals to try something new,” said Pam Williams, Tourism Sales Manager for the CVB. The theme of Huntsville Restaurant Week is “ten tasty days of deals,” referencing the specially-priced menu options provided by participating restaurants as part of the event. Lunch specials include fixed-price selections at $10 or $15 featuring two courses. Dinner specials include selections at $10, $20, $30, and $40 with three courses. Restaurants may choose to offer one or any combination of the above specials, or offer other specials beyond these categories. Exclusive to Huntsville Restaurant Week, a ‘Bonus Bites’ category is also featured to include those establishments that do not offer a traditional lunch or dinner but do offer breakfast, desserts, appetizers or small bites exclusively. Returning again for 2018 is the participation of various Huntsville and Madison breweries. Straight to Ale, Green Bus, Old Black Bear, Rocket Republic, Yellowhammer, and Blue Pants breweries will be offering specialty Restaurant Week brews. Craft beer enthusiasts are encouraged to be on the lookout for the designated Huntsville Restaurant Week badge on the popular Untappd mobile app; those who try at least two of the available Restaurant Week beers are eligible to unlock the badge. New for 2018, the CVB has also partnered with OpenTable, an online restaurant reservation platform, as the official online reservation provider for Huntsville Restaurant Week. Visitors can seamlessly view participating Huntsville restaurants on OpenTable, and with a few clicks, secure a reservation to the venue of their choice. A partnership with The House mobile app will also showcase daily specials and events to users in both the Huntsville and Birmingham areas. The Huntsville/Madison County CVB will be hosting ten days of giveaways. Simply tweet or post to social media using the official Restaurant Week hashtag #DineHsv with your favorite part of Huntsville Restaurant Week, what dish you most want to try, etc. A winner will be chosen each day throughout the ten days of Restaurant Week to win restaurant gift cards and CVB prizes. Various Huntsville food bloggers and social media influencers joined forces with Trace Barnett, former contestant on The Next Food Network Star and creator of The Bitter Socialite; Delia Jo Ramsey, a Nashville-based blogger also recognized as a Zagat-rated “Top 100 Food Instagrammer of 2017;” and Birmingham-based Amber and Russell Hooks of Happenin’s in the Ham, to come together for a dining tour of six participating Restaurant Week establishments. In efforts to promote Huntsville Restaurant Week to potential “foodie” visitors from out of market, the bloggers have published their experiences in the Rocket City online and on social media to their respective followers. The CVB’s own blog, iHeartHsv.com, will be featuring dedicated food and beverage content throughout the month of August.